Protein Molecular Weight ladder PS10 (prestained) is ideal for precise sizing of proteins by SDS-PAGE and for Western blotting. The Protein ladder PS10 PLUS is a mixture of 10 purified proteins which are re-dissolved 'ready-to-use' in loading buffer. 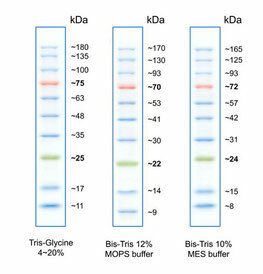 The proteins resolve into 10 sharp bands in the range of 11-180 kDa when analysed by SDS-PAGE and stained with optimized dyes. The marker is ready-to-use. There is no need to boil. • Sizing of proteins on SDS-polyacrylamide gels and Western blots. - Thaw marker at room temperature or heat at 37 – 40 °C for a few minutes. Do not boil! 1 ml Protein ladder is sufficient for 100 mini gels or 50 standard gels. It is recommended to divide the marker into aliquots to avoid contamination of the stock solution. 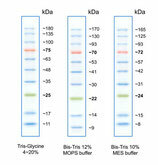 Protein ladder PS10 PLUS is optimized for runs on 12 % SDS polyacrylamide gels. 8 to 10 % gels may cause proteins with low molecular weights to migrate with the dye front. On 12 to 15 % and gradient gels all bands are visible. Tested in SDS-polyacrylamide gel electrophoresis and Western blotting. 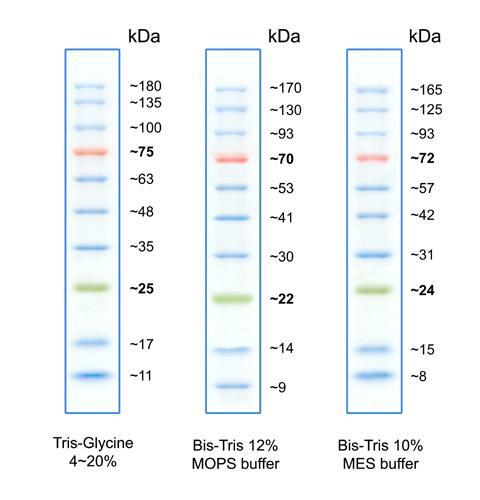 Protein Molecular Weight Marker PS10 (prestained) is ideal for precise sizing of proteins by SDS-PAGE and for Western blotting.